Vortex, my first kite build! GWTW Forum > Kites! Kites! Kites! > Kite Building and Repair > Vortex, my first kite build! Re: Vortex, my first kite build! Great idea Mike, or should I say Ken. Without comparing it to my Exile, that opening seems a bit large, but I'll definitely check it out. I have several plastic plates I can check it with, but obviously I will not be cutting with them. If the size works, you can bet I'll add this to my "tool" collection. Just keeping your fingers farther away from a 40w soldering iron would make it worth it! PS, just checked the Exile. It is exactly as you said. Well, I guess a trip to my favorite home improvement store has just been added to my "to do" list for today! PS2, When checking with a cover plate I have here already, I did notice that if it is used, I would be cutting completely through the spine re-enforcement strip I used. I used a 1" wide strip. So, for this build, I will not be doing that. But now that I know that, I will plan ahead for future builds. I know the center-T patch "should" be sufficient to support the sail safely, but right now I'm going to stick with "If it ain't broke, don't fix it.". A bit looser then yours but then maybe that's one of the factors that contributes to that "Blue Moon Feel". Allowing the sail that little bit of slack to pull toward the higher pressure side of the wing? Would that help or hinder another design? I can't line up two holes and two straight cuts plus one cut leaves less edges, I was all over it when Ken held it up and passed it around. While I was waiting for our host to ship the end caps I ordered yesterday, I decided to start on the bridle. My understanding is that all measurements are from the spars or T, not just the end of the cord. So, I wanted to create a Bridle Board the accurately represented the kite's components. 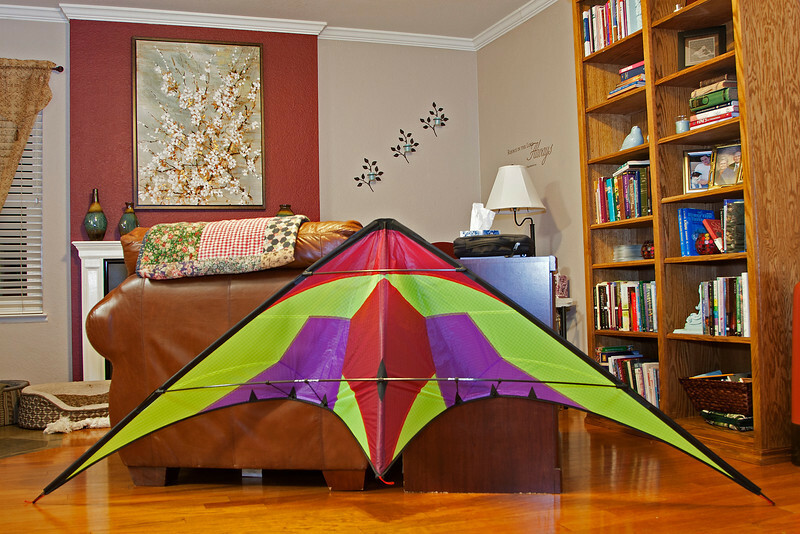 I also wanted to be able to use the board again should I decide to build an STD version of this kite. With this in mind I began by drilling the board and glued in a 1.5" section of .240 dia. ferrule. 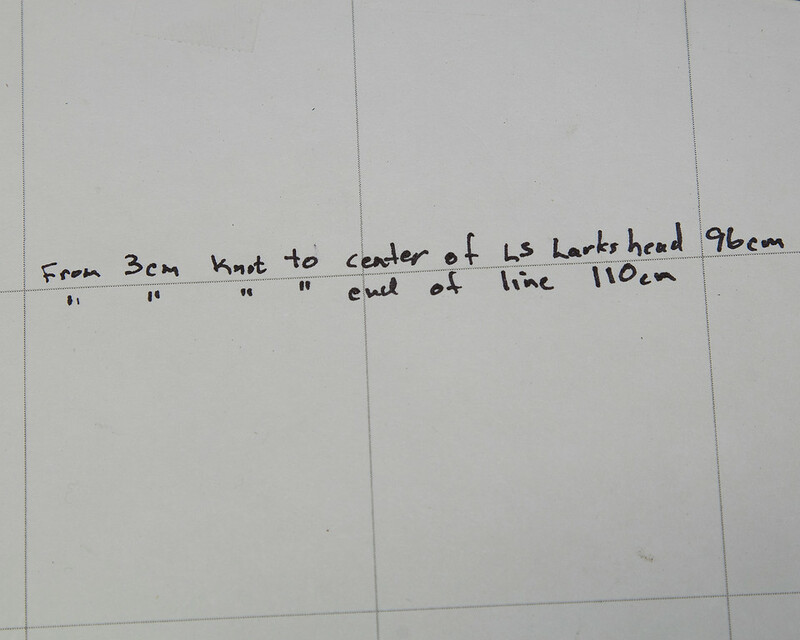 I marked out the board for the single line that runs from the US to the LS at the LE. 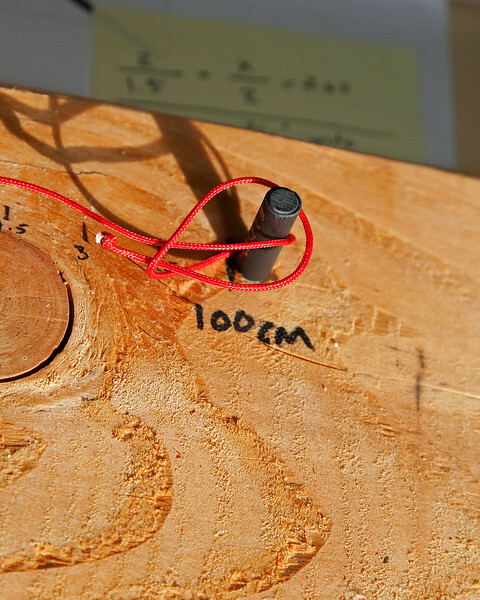 This segment measures 100cm, and the in-haul attaches 50cm from either end. I then inserted another piece of ferrule at the 100cm mark. Note that the rods are on the outside edge of the 100cm marks. This represents the frame and the 100cm would be between them. Let's try a picture to see if that helps. Next to the rod are two short sections of the spars I am using. P90 and P100. These short sections are slipped over the posts so that when attaching the bridle segments, I get very exact measurements. The first segment I create is a pig-tail to be attache at the US. SO I put the P90 sleeve on the post and tie a Cow hitch with and overhand stopper knot. I us the P90 sleeve because my ULE is P90. I then mark the line at 1.5cm from the post. I tie another overhand there. 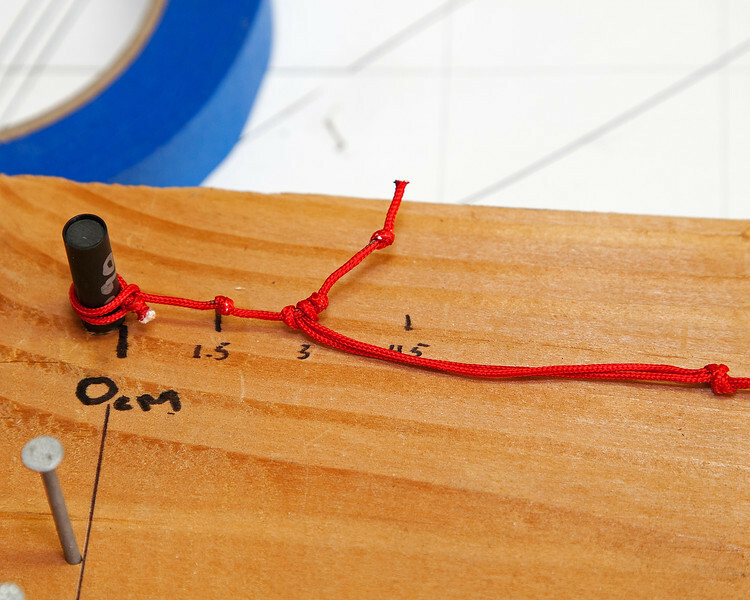 I continue this process until I have three knots at 1.5, 3 and 4.5cm from the hitch post. 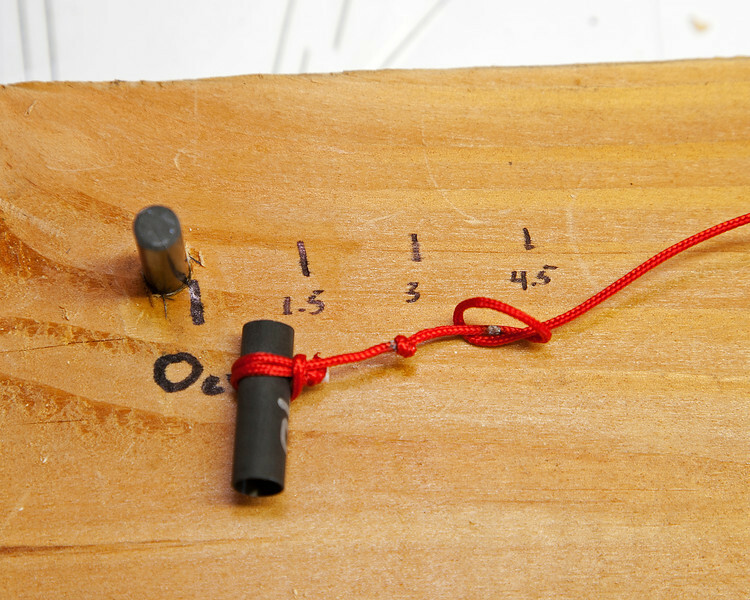 When I have all three knots in place, I use the soldering iron to cut the cord about 1cm past the last knot. I then repeat this process at the 100cm end. I use a P100 sleeve over the post on that end because my LLE is P100. Again I ancho to the post with a cow hitch. Looks kinda like a larks head doesn't it? Once I have the pig -tails complete on both ends, I start on the rest of the up/down outhaul line. I start by measuring of 20cm of line and folding it in half. I use an overhand knot to create a loop. 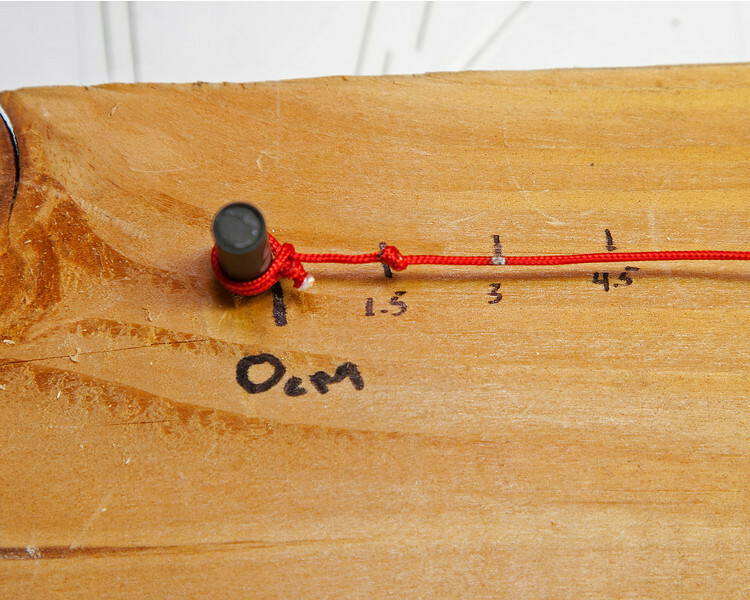 I then connect it to the pig-tail at the 0cm side with a larkshead knot. I place this at the 3cm knot. This will give me one short and one long adjustment at each end of the line. Now that I have attached the center section to the upper pig-tail, I measure out 110cm of line from the 3cm knot and cut the line there. Next I mark the line 96cm from the 3cm knot. I fold the short end at that mark and use an overhand to create a loop. Once the loop is created, I remove the P100 sleeve from the post leaving the pig-tail tied to it. 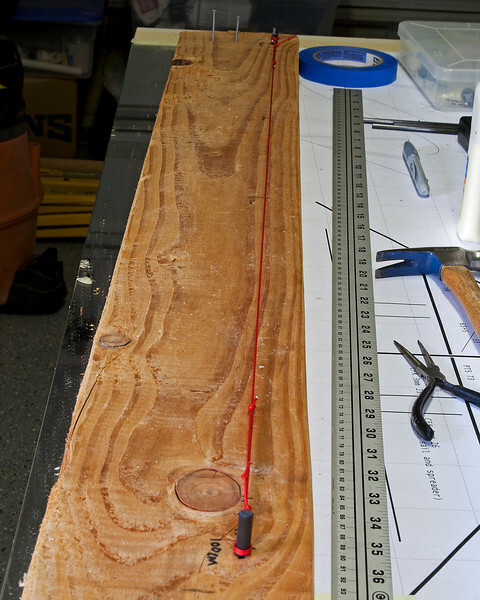 I then use a larks head to attach the center line to the 3cm not located on the 100cm end of the board. If done correctly, the mark on the line at 96cm should be in the middle of the larks head. I then put the sleeve back on the post. When finished, the line should look like this. Here are some notes to help remember the measurements. More on the bridle later. BTW, I got the vinyl end caps this afternoon. So, here is a sneak peak. looking very nice. Really excellent job for your first build. I won't even show close up pictures of my first build (which was l'quartz). I like your bridle board... check out my upcoming picks for the jig/bridle board I built. I saw your teaser on it. It looks very interesting. If I start building more than a couple kites a year, I will seriously consider it. /mme throws some hint in. For spar cutting, especially if you want, have to cut a lot of them. Get an arrow saw. those let you cut them without the risk of a vice grip or other hazards. The resulting cuts are very clean and the end will be sanded flat at the same time. And they are not that outrageous expensive. An option to consider if you like quality builds. 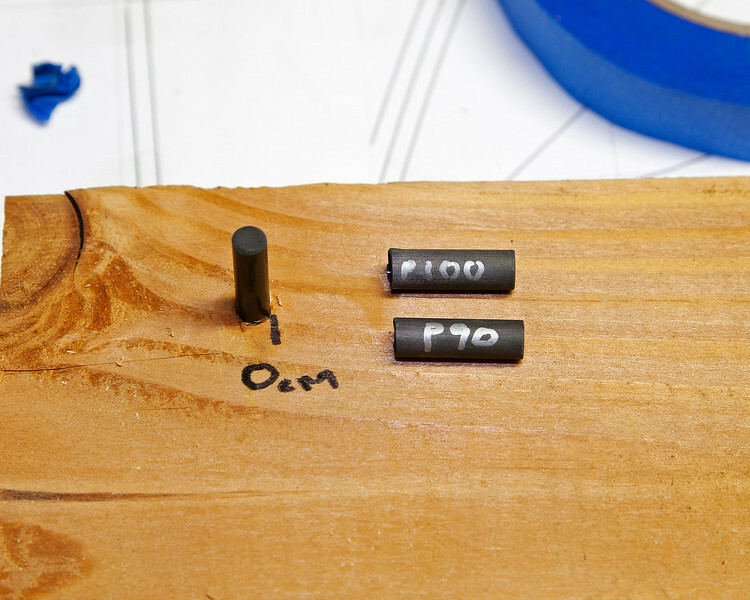 Or if you have a Dremel already, you can easily build one yourself. The saw I used was inexpensive, but honestly, even though it worked, it was not ideal. I made it work but only by being extremely careful, and back cutting the finishing side before finishing the cut. Back cutting helped reduce the splintering that would sometimes occur. I will be picking up a small Dremel before the next build. Oh I see they now have a 6" chop saw and proper metal blades available under $40 to make a dedicated spar cutter just remove the vice jaws and replace them with an extruded aluminum 90* angle with a tape measure or similar markings glued to it. Harbor Freight has a hobby cut off saw which also has one of the fiberglass cut off wheels. I modified mine so it is sort of an arrow saw. Works fine, and for $30 or less, not bad. It was Dave's thread (Kiteguy) over on Kite Builder that clued me in that 2 inch chop saw, I didn't know it came with a fiber wheel too or I would've bought one long ago and followed his modification instructions. OOPS, they no longer come with the fiberglass cut off disk. However I bought a couple at HF. Then they wore out and then none were at HF. I went to eBay and found a package of 6 for less than two cost at HF. The cut off disks were for arrow shaft saws. Take a hard look at this picture. Do you see an issue? I do. There are ripples in the fabric between the center-T and the inside stand-off on both sides. I'm fairly certain it is caused by too much tension on the sail caused by the stand-off. As you will see when I cover the build of the stand-offs, they are exactly the length stated on the plans, "25cm from sail to spreader". So, that lead me to think the position of the stand-off APA connector on the spreaders is in the wrong location. I can't seem to find the distance from the T that they are "supposed" to be in based on the plans or anyone's experience. Does anyone know what they should be, or should I just adjust them until the sail is smooth? That "wrinkle" is very common, some designers taper the seam from the T to the tail slightly to reduce it by adding a bit more sail tension through that area. You could try some different positions on the standoffs to see if you can smooth it out some, maybe more tension on the spine, reduce the leach line tension, etc. but overall don't worry too much about it, it's a case of over self criticism and noticing something you just never noticed before on your kites because you are now more involved. Is there a gallery of finished Vortex's out here? Do others not have the wrinkle? regarding the wrinkles, I have them on my vortex as well. yes, the wrinkles is part of the design!